Welcome To Free Music Monday! Today’s pick is just the thing to set the mood for Halloween decorating and costume planning, and for the kids’ party later this month: Unpleasantville. If you like Danny Elfman, you’ll like this. A moody tingly delight. It is a soundtrack, so don’t expect any coherence between the songs, but on the other hand, each song describes a different mood. I agree with the other reviewers, despite its name and subject matter, it’s not just for Halloween. Un-Expected pleasure. Okay I admit it. I bought this (well it was free) because of the Halloween connotation to it. What a pleasant surprise! It has a very ‘Nightmare before Christmas’ feel to it and I really like it now. It even brings a smile to my face that it was free! Click here to grab your free copy of Unpleasantville. 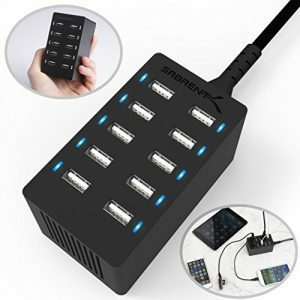 The Sabrent 60 Watt (12 Amp) 10-Port Family-Sized Desktop USB Rapid Charger. Smart USB Charger with Auto Detect Technology offers smart port technology to maximize compatibility with Android, Apple and other devices by enabling charging speeds of up to 12 amps among 10 ports or 2.4 amps per port. This item has an average rating of 4.5/5 stars across over 950 reviews, and Amazon’s currently (as of 10/5/15) offering it at 22% off: priced at $35 instead of the usual $44.99. Eligible for Prime shipping, too!